Everyday carry knives are a fast growing trend and more people are looking to get one, but having trouble with that. The best neck knife can easily be found when you have a well-developed list to start with, like the one that follows. We’ve developed this to help you ensure that your knife is going to be exactly what you’re looking for. A neck knife is a versatile tool and if you’re thinking about getting one for yourself, we will be discussing the factors that make a good neck knife as well as some very good picks to help you find the best neck knife to suit your requirements. So make sure that you take a look at each of these. What Makes A Good Neck Knife? As with most purchases, you will want to get the best bang for your buck. Here are a few things you’ll want to take note of before buying your neck knife. That way, you can make sure that you’re getting the best quality and the best features. Unlike most knives where you will start your focus on the blade, one of the first things you should be checking on your neck knife is its sheath and by extension, the cord. You want a quality sheath that keeps the knife in place despite lots of movement. Good sheath retention cannot be over-emphasized for knives in general but it’s a much bigger deal for neck knives since it will usually be hanging upside down. Go on a hike or run with a flimsy sheath and you could very well lose that knife. 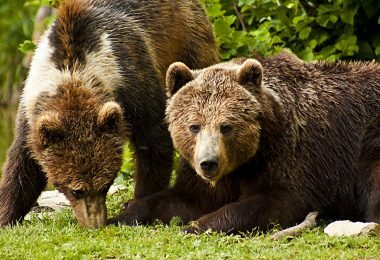 On the flipside, you don’t want a knife that is too hard to yank out, especially during critical instances, such as animal attacks. 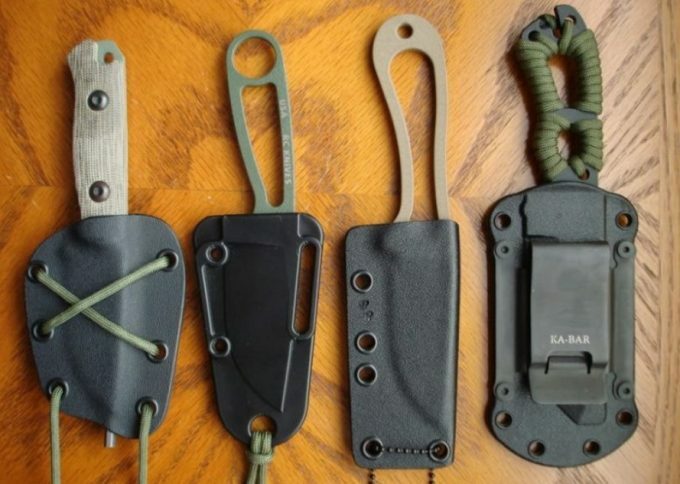 Kydex sheaths will often work well to this end. For the cord, you’ll want a bead cord or detachable lanyard cord. 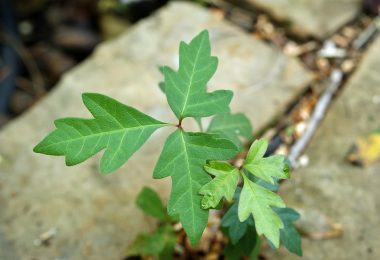 Especially while on hikes, you don’t want to have anything on that can serve to strangle you. A breakaway mechanism is very important for safety. In terms of the knife per se, the blade shape will be your first consideration. Just what will you be using it for? Bowie shaped knives are good all-around. For more precise tasks, such as skinning game or preparing food, you’re better off with a drop point blade or beavertail. If you’ve bothered to train in Filipino-martial arts or Kali then a karambit-type knife may be for you. As with any other knife, you will want to have a grasp on the type of steel used for the blade. There are two general variants. Carbon steel variants are usually better in terms of easy sharpening, these are usually more prone to rust. On the flip side, stainless steel variants aren’t as good at edge retention, however, they have the benefit of much higher corrosion resistance. If, like most folks, you intend to wear the neck knife under your shirt, your knife will probably be exposed to quite a bit of sweat. That will tend to tip the scales in favor of stainless steel for neck knives. Some folks stow their folding knives under their shirts. To us that seems a bit counter-productive as that drastically increases the deployment time of the blade. In the event of an emergency, you want to avoid fumbling around to get your knife. That plus the stability of a fixed blade is really nice to have. So take our word for it. If you’re going for a neck carry, you want a fixed blade. One of the factors that make neck knives so attractive is the fact that they aren’t cumbersome. Sure some folks are fine heaving their 16.oz hunting knives around, but that’s not for everybody. Having something dangling from cord draped around your neck can be a bother if it’s heavy. You’ll want a light knife. These products are the best ones that we’ve been able to find. 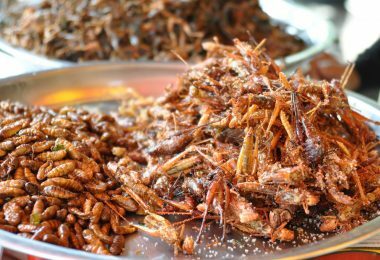 They have a variety of different features and different sizes as well as a whole lot more, so you won’t have to worry about how you’re going to get something good. You can take a look at the options we’ve already got for you and start narrowing it down even more from there. 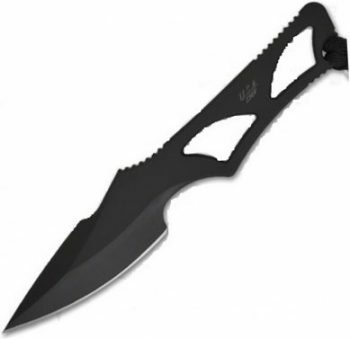 Description: The Cold Steel Brave Heart Kraton is a compact and versatile multi-purpose neck knife. The shape and long blade length, coupled with its quality construction, allow for various types of precision work under wet or dry circumstances. The sharp tip is ideal for piercing. Quality jimping on the spine works to aid in providing quality grip. The flat and slim cross-section will ensure that the knife will resist unnecessary twisting while being used. The Kraton grip allows for maximum control of the knife as well as strong resilience against damage due to shock. The Secure-Ex Sheath is great for a one-handed draw. The configuration makes it good for either a boot or neck knife. When carrying it around your neck, however, be sure to couple it with a good bead chain/lanyard with a safety detachment system. You definitely don’t want that to inadvertently choke you. Related: The Cold Steel Vietnam Tomahawk is a great tool for the next time you’re out in the wilderness. It’s a great way to improve your chances when you’re camping. Description: The name Enyo is derived from a mythological war goddess. She is the companion of Ares, Greek god of war. Spartan Enyo Fixed Blade Knife is definitely appropriately named. The black tungsten finish and skeletal frame give the knife an intimidating appeal. The plain edge drop point shape of the blade allows for various general applications making the knife great for EDC use. The CPM S35VN provides superior toughness against edge chipping while also providing an improved edge retention. Being stainless, the blade’s construction is highly resistant to corrosion. The fitted Kydex Sheath is great for quick one-handed draws and comes with a neck chain made of stainless steel. It also comes with an IWB Loop and paracord for carry options other than via the neck. Related: Anyone traveling in the wilderness or anywhere should have a multi-tool and the Leatherman Multi-Tool is one of the best options. Description: The Anginstar Tactical Survival Pocket Knife is a lightweight pocket knife that can function as a neck carry knife. On the whole, it is lightweight and offers a very compact build ideal for anyone looking to have a knife handy all day, every day. The 440C Stainless steel gives the Defense Claw a hardy defense against corrosion. The construction offers a solid and comfortable grip. It comes with a clip which can be moved from left to right depending on your preferred carrying orientation. The locking mechanism is very stable and allows for no play or wiggling at all. The wave feature allows for rapid deployment, though using it effectively will require some getting used to. The form is derived from a southeast Asian weapon, the karambit. As such, users with training in Silat or Kali will definitely appreciate the use of this knife, especially from a combat or self-defense standpoint. Despite being a pretty well-built blade all around, this Anginstar model does have its shortcomings. For one thing, if you’re looking for a knife to carry around your neck, chances are you won’t want a folding one. Related: The Lanksy PS-MED01 BladeMedic is inexpensive and works great for getting your knife in just the right shape. Description: The Esee Knives Izula II Knife is a well-known variant of the ESEE Izula series. The moniker Izula stems from a Peruvian ant named Isula, more known to us as the bullet ant. It’s a small ant with an extremely powerful sting. The Izula II does not fail to live up to its name. 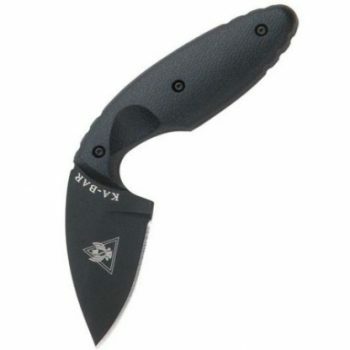 The highly regarded knife features a 2.63 in. blade length, which allows for concealability which is a deciding factor for many neck knives. The carbon steel material offers easy resharpening and the possibility of use with a Ferro rod if ever the need should arise. The lightweight 3.2 oz. 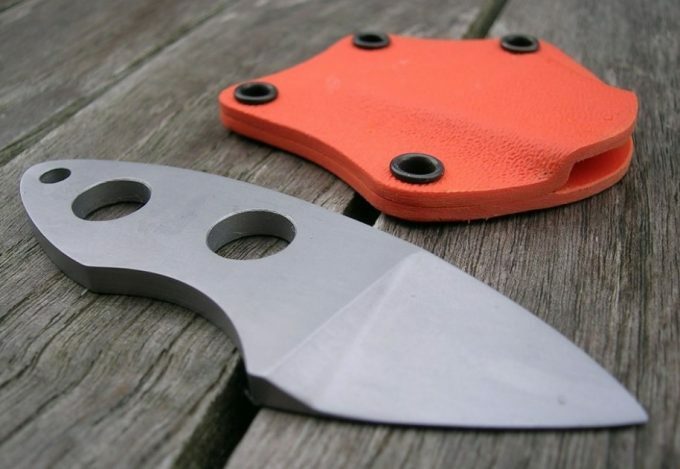 knife provides a little bit more weight than some of the other offerings in the market but does not compromise usability as a neck carry knife. Its slim profile makes it perfect either for neck carry or pocket. Also noteworthy is the ESEE Lifetime Warranty. It’s a lifetime no-questions-asked warranty, something which is pretty hard to top. Related: If you really want to make your knife secure the Blade-Tech Tek-Lok is a great addition. It’s small and easy to use and it improves security greatly. Description: The Columbia River Folts Minimalist Bowie is a great companion for an outdoor trip. It isn’t meant to take the role of a large blade meant for heavy work, nor is it an all-around knife. 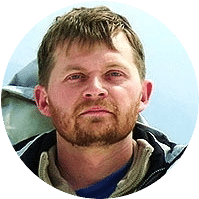 What the Columbia River Folts Minimalist Bowie excels at are the precise chores that need to be done in camp, such as cooking, cutting paracord or handling hunting-related tasks. The bowie blade shape is reminiscent of many hunting knives. This is definitely a great fixed blade to have, worthy of being a day-to-day EDC or a secondary wilderness knife. It’s a potentially great neck knife. The 5Cr15MoV Stainless Steel provides corrosion resistance, which is great if it’s intended to be worn under a shirt. Everyday cutting tasks are a breeze with the great comfort and feel of the knife. Related: The Columbia River Knife is a great compliment to this knife. It’s priced right about the same and is a similar size as well. 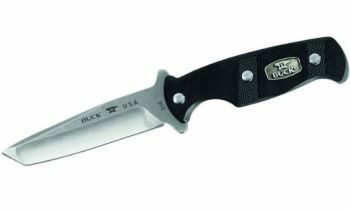 Description: The Buck Knives 0616Bks Ops Knife is a mean and versatile knife for its size. The 3in blade and full tang construction provide enough blade for a variety of rugged applications. The size of the blade is just short enough to keep it from becoming unwieldy for more precise tasks, such as carving snare sets and skinning game. The 2.5oz. weight and small size make it light and unobtrusive, great for carrying throughout the day. The tough G10 grip provides great control over the knife for easy use. 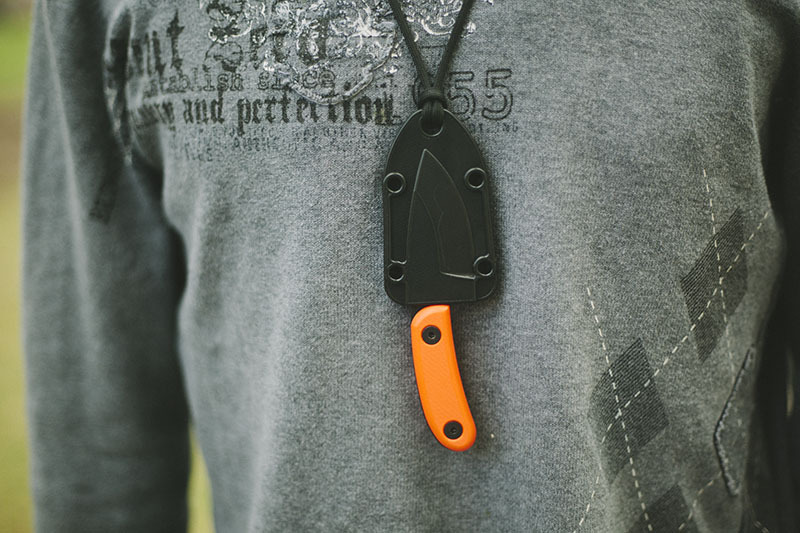 The knife fits snuggly into the polypropylene and leather sheath, making it a highly viable neck knife option. Alternatively, it can be carried via an ankle strap or on a belt for more options. The 154 CM Steel provides ample corrosion protection. Related: The Smith’s PP1 Pocket Pal Sharpener is great to have on hand because it’s inexpensive and it keeps your knife in tip-top shape at all times. Description: The Knives Ranch Damascus Neck Knife is a departure from the common tactical makes that dominate the knife market today. The crafted bone handle and leather sheath provide an older aesthetic which may appeal to more traditional users. The combination of AISI 1075 and AISI 4340 works well to provide high-grade edge retention. Definitely concealable due to small size. Definitely a good option for an around the neck carry. 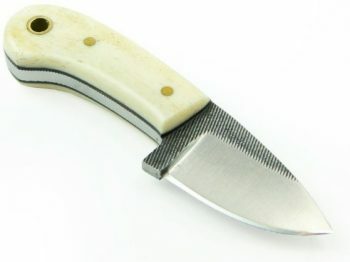 This Knives Ranch model may pose problems for anyone wanting any sort of heft to their knife. At 4 inches overall, it’s a small knife. This may be a deal breaker for some. The combination of steels doesn’t guard all that well against corrosion. Hence, the knife will require a bit of maintaining. 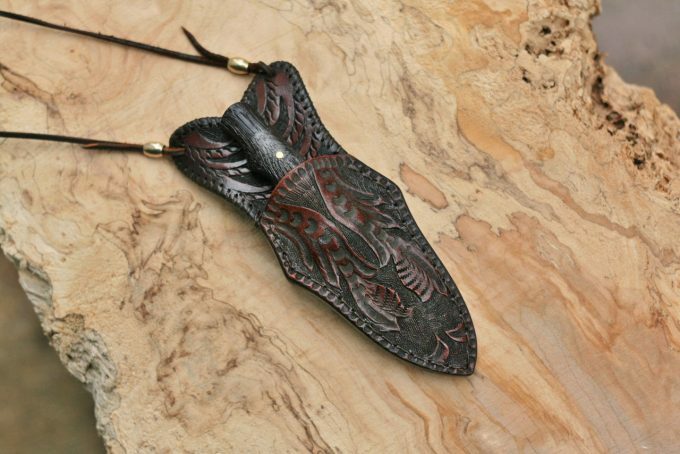 The sheath can also succumb earlier to wear and tear relative to other offerings because of its leather construction. Related: You’re going to want a chair to sit in while you’re camping and the Moon Lence Ultralight is a great choice that keeps you comfortable and doesn’t take up too much space. Description: The Ka-Bar Tdi Law Enforcement Knife is an excellent EDC knife, especially if your purpose is for self-defense. The knife was designed for law enforcement use, particularly when the sidearm is inaccessible or compromised. The unusual “offhand” knife, which is drawn like a pistol, will give users the ability to deploy their knife extremely quickly. This comes especially useful for extremely close quarters. 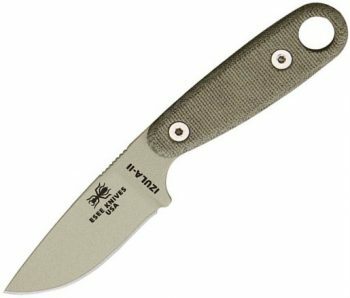 The AUS-8A steel is highly resistant to corrosion and the knife comes with a very sharp edge. The handle provides great grip and control which are critical for the knife’s intended use. The sheath is also high quality, allowing for various carry orientations. While it is excellent for the intended purpose of self-defense, in other avenues where one would use an EDC knife the TDI Law Enforcement may fall a bit short. The handle’s shape, while incredibly effective for self-defense, may prove to be a bit awkward for other tasks. Also, it loses effectiveness as a neck carry knife as it was designed to be drawn from the hip, or leg. The drawing angle becomes awkward if done from the neck. 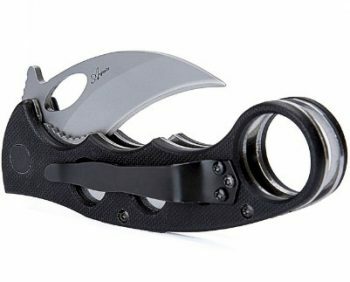 Needless to say, this would hamper your ability to quickly draw the blade in a self-defense situation. Related: Carrying this knife on your belt can be a great way to use it and the Ka-Bar Metal Belt Clip makes sure it’s going to stay where you want and be secure as well. Description: The knives produced by ESEE are held in high regard by many and it’s because of the high level of quality found in their products. The Esee Knives Candiru Molded Sheath is by no means an exception. 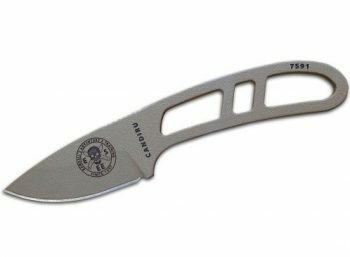 For a small knife, just being over 5 inches, the Candiru is able to perform all tasks you would expect to be able to do with a 5-inch knife. Granting that you won’t be battening with it anytime soon, the Candiru is great for basic woodwork and dressing game. Simple cutting tasks are great as well. The ergonomic shape, when used with the micarta scales, work wonderfully, providing a superb three-fingered grip. The sheath allows for a confident one-handed draw whether in upright or bottoms up orientation. 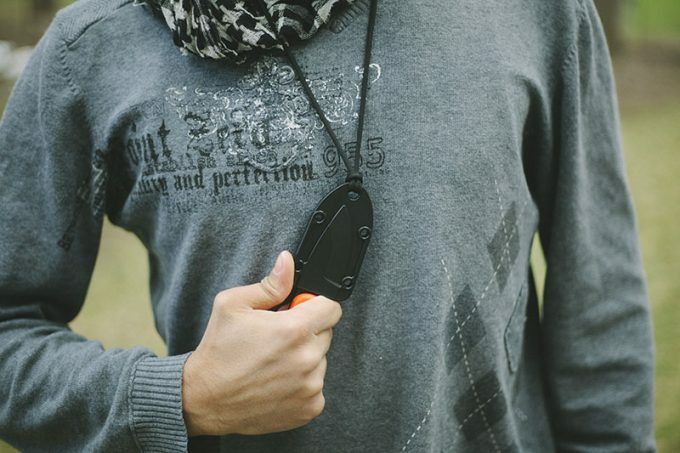 The Candiru is a great EDC option, whether worn on the hip, as a neck carry, or in a pocket. However, if carried around the neck, it is better off used on the outside of your shirt. The carbon steel make doesn’t jive well with sweat. The Candiru will generally fit the bill for the generic, light, EDC application. Related: The Micarta Handle for this knife is a great addition and can definitely make it a lot easier and more comfortable to carry it with you. The right neck knife, at the end of the day, is the one that you are most comfortable with. Taking into consideration weight, shape, blade characteristics and overall ergonomics in relation to your utilization will be critical in finding the best choice. Also, make it a point to research local legislation on carrying knives. Each state has different specifications on what is legal and what is not. You definitely don’t want to find yourself in a pinch because you carried a weapon in a location where it is deemed illegal. So what do you think of these knives and the features they provide? Do you have any of these knives and think it’s really great? Do you have any other knives that you like better? We definitely want to hear about them.